Volcanic landforms are controlled by the geological processes that form them and act on them after they have formed. Thus, a given volcanic landform will be characteristic of the types of material it is made of, which in turn depends on the prior eruptive behavior of the volcano. Although later processes can modify the original landform, we should be able to find clues in the modified form that lead us to conclusions about the original formation process. Here we discuss the major volcanic landforms and how they are formed, and in some cases, later modified. Most of this material will be discussed with reference to slides shown in class that illustrate the essential features of each volcanic landform. A shield volcano is characterized by gentle upper slopes (about 5o) and somewhat steeper lower slopes (about 10o). Shield volcanoes are composed almost entirely of relatively thin lava flows built up over a central vent. Most shields were formed by low viscosity basaltic magma that flows easily down slope away form the summit vent. The low viscosity of the magma allows the lava to travel down slope on a gentle slope, but as it cools and its viscosity increases, its thickness builds up on the lower slopes giving a somewhat steeper lower slope. Most shield volcanoes have a roughly circular or oval shape in map view. Very little pyroclastic material is found within a shield volcano, except near the eruptive vents, where small amounts of pyroclastic material accumulate as a result of fire fountaining events. Shield volcanoes thus form by relatively non-explosive eruptions of low viscosity basaltic magma. Vents for most shield volcanoes are central vents, which are circular vents near the summit. Hawaiian shield volcanoes also have flank vents, which radiate from the summit and take the form of en-echelon fractures or fissures, called rift zones, from which lava flows are emitted. This gives Hawaiian shield volcanoes like Kilauea and Mauna Loa their characteristic oval shape in map view. Have steeper slopes than shield volcanoes, with slopes of 6 to 10o low on the flanks to 30o near the top. The steep slope near the summit is due partly to thick, short viscous lava flows that do not travel far down slope from the vent. The gentler slopes near the base are due to accumulations of material eroded from the volcano and to the accumulation of pyroclastic material. Stratovolcanoes show inter-layering of lava flows and pyroclastic material, which is why they are sometimes called composite volcanoes. Pyroclastic material can make up over 50% of the volume of a stratovolcano. Lavas and pyroclastics are usually andesitic to rhyolitic in composition. Due to the higher viscosity of magmas erupted from these volcanoes, they are usually more explosive than shield volcanoes. Stratovolcanoes sometimes have a crater at the summit that is formed by explosive ejection of material from a central vent. Sometimes the craters have been filled in by lava flows or lava domes, sometimes they are filled with glacial ice, and less commonly they are filled with water. Long periods of repose (times of inactivity) lasting for hundreds to thousands of years, make this type of volcano particularly dangerous, since many times they have shown no historic activity, and people are reluctant to heed warnings about possible eruptions. Cinder cones are small volume cones consisting predominantly of tephra that result from strombolian eruptions. They usually consist of basaltic to andesitic material. They are actually fall deposits that are built surrounding the eruptive vent. Slopes of the cones are controlled by the angle of repose (angle of stable slope for loose unconsolidated material) and are usually between about 25 and 35o. They show an internal layered structure due to varying intensities of the explosions that deposit different sizes of pyroclastics. On young cones, a depression at the top of the cone, called a crater, is evident, and represents the area above the vent from which material was explosively ejected. Craters are usually eroded away on older cones. If lava flows are emitted from tephra cones, they are usually emitted from vents on the flank or near the base of the cone during the later stages of eruption. Cinder and tephra cones usually occur around summit vents and flank vents of stratovolcanoes. An excellent example of cinder cone is Par�cutin Volcano in Mexico. This volcano was born in a farmers corn field in 1943 and erupted for the next 9 years. Lava flows erupted from the base of the cone eventually covered two towns. Cinder cones often occur in groups, where tens to hundreds of cones are found in one area. Maars result from phreatic or phreatomagmatic activity, wherein magma heats up groundwater, pressure builds as the water to turns to steam, and then the water and preexisting rock (and some new magma if the eruption is phreatomagmatic) are blasted out of the ground to form a tephra cone with gentle slopes. Parts of the crater walls eventually collapse back into the crater, the vent is filled with loose material, and, if the crater still is deeper than the water table, the crater fills with water to form a lake, the lake level coinciding with the water table. Volcanic Domes result from the extrusion of highly viscous, gas poor andesitic and rhyolitic lava. Since the viscosity is so high, the lava does not flow away from the vent, but instead piles up over the vent. Blocks of nearly solid lava break off the outer surface of the dome and roll down its flanks to form a breccia around the margins of domes. The surface of volcanic domes are generally very rough, with numerous spines that have been pushed up by the magma from below. Most dome eruptions are preceded by explosive eruptions of more gas rich magma, producing a tephra cone into which the dome is extruded. Volcanic domes can be extremely dangerous. because they form unstable slopes that may collapse to expose gas-rich viscous magma to atmospheric pressure. This can result in lateral blasts or Pelean type pyroclastic flow (nu�e ardentes) eruptions. Craters are circular depressions, usually less than 1 km in diameter, that form as a result of explosions that emit gases and tephra. Calderas are much larger depressions, circular to elliptical in shape, with diameters ranging from 1 km to 50 km. Calderas form as a result of collapse of a volcanic structure. The collapse results from evacuation of the underlying magma chamber. In shield volcanoes, like in Hawaii, the evacuation of the magma chamber is a slow drawn out processes, wherein magma is withdrawn to erupt on from the rift zones on the flanks. In stratovolcanoes the collapse and formation of a caldera results from rapid evacuation of the underlying magma chamber by voluminous explosive eruptions that form extensive fall deposits and pyroclastic flows. Calderas are often enclosed depressions that collect rain water and snow melt, and thus lakes often form within a caldera. Crater Lake Caldera in southern Oregon is an 8 km diameter caldera containing a lake The caldera formed about 6800 years ago as a result of the eruption of about 75 km3 of rhyolite magma in the form of tephra, found as far away as Canada, accompanied by pyroclastic flows that left thick deposits of tuff on the flanks of the volcano. Subsequent eruptions have built a cinder cone on the floor of the caldera, which now forms an island called Wizard Island. Larger calderas have formed within the past million years in the western United States. These include Yellowstone Caldera in Wyoming, Long Valley Caldera in eastern California, and Valles Caldera in New Mexico. 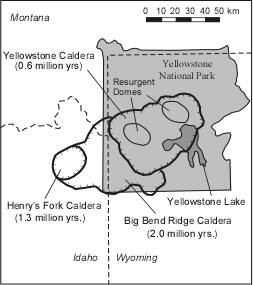 The Yellowstone caldera is an important example, as it illustrates the amount of repose time that might be expected from large rhyolitic systems, and the devastating effect caldera forming eruptions can have on widespread areas. Yellowstone Caldera which occupies most of Yellowstone National Park, is actually the third caldera to form in the area within the past 2 million years. The three calderas formed at 2.0 million years ago, 1.3 million years ago, and the latest at 600,000 years ago. Thus the repose time is on the average about 650,000 years. Tephra fall deposits from the latest eruption are found in Louisiana and into the Gulf of Mexico, and covered much of the Western part of the United States. The eruption 600,000 years ago produced about 1000 km3 of rhyolite (in comparison, the eruption of Mt. St. Helens in May of 1980 produced only 0.75 km3. Magma still underlies Yellowstone caldera, as evidenced by the large number of hot springs and geysers in the area. After the formation of a caldera by collapse, magma is sometimes re-injected into the area below the caldera. This can result in uplift of one or more areas within the caldera to form a resurgent dome. Two such resurgent domes formed in the Yellowstone caldera, as shown above. If magma leaks back to the surface during this resurgent doming, then eruptions of small volcanic domes can occur in the area of the resurgent domes. A fumarole is vent where gases, either from a magma body at depth, or steam from heated groundwater, emerges at the surface of the Earth. Since most magmatic gas is H2O vapor, and since heated groundwater will produce H2O vapor, fumaroles will only be visible if the water condenses. (H2O vapor is invisible, unless droplets of liquid water have condensed). Hot springs or thermal springs are areas where hot water comes to the surface of the Earth. Cool groundwater moves downward and is heated by a body of magma or hot rock. A hot spring results if this hot water can find its way back to the surface, usually along fault zones. Minerals dissolved in the high temperature water are often precipitated when the water cools at the surface. This produces spectacular deposits of travertine (chemically precipitated calcite, or siliceous sinter. Bacteria forming microbial mats under the water are responsible for the coloration often seen in hot springs. Different species, with different colors thrive at different temperatures. A geyser results if the hot spring has a plumbing system that allows for the accumulation of steam from the boiling water. When the steam pressure builds so that it is higher than the pressure of the overlying water in the system, the steam will move rapidly toward the surface, causing the eruption of the overlying water. Some geysers, like Old Faithful in Yellowstone Park, erupt at regular intervals. The time between eruptions is controlled by the time it takes for the steam pressure to build in the underlying plumbing system. Plateau or Flood basalts are extremely large volume outpourings of low viscosity basaltic magma from fissure vents. The basalts spread huge areas of relatively low slope and build up plateaus. The only historic example occurred in Iceland in 1783, where the Laki basalt erupted from a 32 km long fissure and covered an area of 588 km2 with 12 km3 of lava. As a result of this eruption, homes were destroyed, livestock were killed, and crops were destroyed, resulting in a famine that killed 9336 people. In Oregon and Washington of the northwestern U.S., the Columbia River Basalts represent a series of lava flows all erupted within about 1 million years 12 million years ago. One of the basalt flows, the Roza flow, was erupted over a period of a few weeks traveled about 300 km and has a volume of about 1500 km3. In the discussion we had last lecture about how magmas form, we pointed out that since the upper parts of the Earth are solid, special conditions are necessary to form magmas. These special conditions do not exist everywhere beneath the surface, and thus volcanism does not occur everywhere. If we look at the global distribution of volcanoes we see that volcanism occurs four principal settings. Along divergent plate boundaries, such as Oceanic Ridges or spreading centers. In areas of continental extension (that may become divergent plate boundaries in the future). Along converging plate boundaries where subduction is occurring. And, in areas called "hot spots" that are usually located in the interior of plates, away from the plate margins. Active volcanism is currently taking place along all of oceanic ridges, but most of this volcanism is submarine volcanism and does not generally pose a threat to humans. Volcanism also occurs in continental areas that are undergoing episodes of extensional deformation. A classic example is the East African Rift Valley, where the African plate is being split. The extensional deformation occurs because the underlying mantle is rising from below and stretching the overlying continental crust. Upwelling mantle may melt to produce magmas, which then rise to the surface, often along normal faults produced by the extensional deformation. Basaltic and rhyolitic volcanism is common in these areas. In the same area, the crust has rifted apart along the Red Sea, and the Gulf of Aden to form new oceanic ridges. This may also be the fate of the East African Rift Valley at some time in the future. Other areas where extensional deformation is occurring within the crust is Basin and Range Province of the western U.S. (eastern California, Nevada, Utah, Idaho, western Wyoming and Arizona) and the Rio Grande Rift, New Mexico. These are also areas of recent basaltic and rhyolitic volcanism. The convergent boundary along the coasts of South America, Central America, Mexico, the northwestern U.S. (Northern California, Oregon, & Washington), western Canada, and eastern Alaska, are boundaries along which oceanic lithosphere is being subducted beneath continental lithosphere. This has resulted in the formation of continental volcanic arcs that form the Andes Mountains, the Central American Volcanic Belt, the Mexican Volcanic Belt, the Cascade Range, and the Alaskan volcanic arc. The Aleutian Islands (west of Alaska), the Kurile-Kamchatka Arc, Japan, Philippine Islands, and Marianas Islands, New Zealand, and the Indonesian Islands, along the northern and western margins of the Pacific Ocean are zones where oceanic lithosphere is being subducted beneath oceanic lithosphere. These are all island arcs. Basaltic magmas generated by flux melting of the mantle overlying the subduction zone. Through magmatic differentiation, basaltic magmas change to andesitic and rhyolitic magma. Because these magmas are often gas rich and have all have relatively high viscosity, eruptions in these areas tend to be violent, with common Strombolian, Vulcanian, Plinian and Pelean eruptions. Volcanic landforms tend to be cinder cones, stratovolcanoes, volcanic domes, and calderas. Repose periods between eruptions tend to be hundreds to thousands of years, thus giving people living near these volcanoes a false sense of security. Volcanism also occurs in areas that are not associated with plate boundaries, in the interior of plates. These are most commonly associated with what is called a hot spot. Hot spots appear to result from plumes of hot mantle material upwelling toward the surface, independent of the convection cells though to cause plate motion. Hot spots tend to be fixed in position, with the plates moving over the top. As the rising plume of hot mantle moves upward it begins to melt to produce magmas. These magmas then rise to the surface producing a volcano. But, as the plate carrying the volcano moves away from the position over the hot spot, volcanism ceases and new volcano forms in the position now over the hot spot. This tends to produce chains of volcanoes or seamounts (former volcanic islands that have eroded below sea level). Volcanism resulting from hotspots occurs in both the Atlantic and Pacific ocean, but are more evident on the sea floor of the Pacific Ocean, because the plates here move at higher velocity than those under the Atlantic Ocean. A hot spot trace shows up as a linear chain of islands and seamounts, many of which can be seen in the Pacific Ocean. The Hawaiian Ridge is one such hot spot trace. Here the Big Island of Hawaii is currently over the hot spot, the other Hawaiian islands still stand above sea level, but volcanism has ceased. Northwest of the Hawaiian Islands, the volcanoes have eroded and are now seamounts. The ages of volcanic rocks increase along the Hawaiian Ridge to the northwest of Hawaii. The prominent bend observed where the Hawaiian Ridge intersects the Emperor Seamount chain has resulted from a change in the direction of plate motion over the hot spot. Note that when the Emperor Seamount chain was produced, the plate must have been moving in a more northerly direction. The age of the volcanic rocks at the bend is about 50 million years. Define the following and state what kind of magma characteristically erupts from each: (a) shield volcano, (b) stratovolcano, (c) cinder cone, (d) maar, (3) lava dome. What is a caldera and how do calderas form? Give several examples. What is the difference between a lava dome and a resurgent dome? Why are volcanic domes considered to be extremely dangerous? Compare and contrast geysers, hot springs, and fumaroles. What kind of volcanic landforms would you expect to find in each of the following tectonic settings (a) diverging plate boundary, (b) converging plate boundary, (c) hot spot. Give examples of volcanoes that occur at (a) hot spots, (b) diverging plate boundaries, and (c) converging plate boundaries.